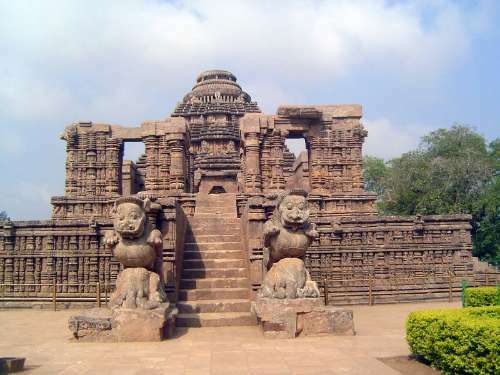 The Sun Temple at Konarak is a superlative in a country of superlatives. 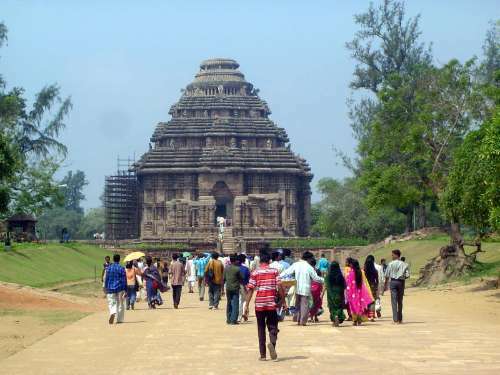 Built, it appears, in the 13th century, it was abandoned after the Muslim invasion of Orissa early in the 16th. 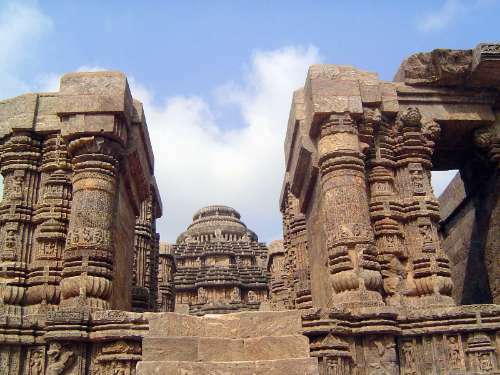 Composed largely of khondalite, a gneiss that weathers easily, without maintenance the temple began to fall apart. 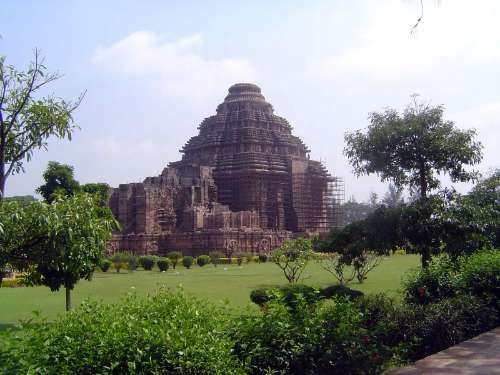 Approximately half of it was gone when European visitors arrived for the first time in the 19th century. Shortly after 1900, serious conservation efforts were made to stabilize what remained. 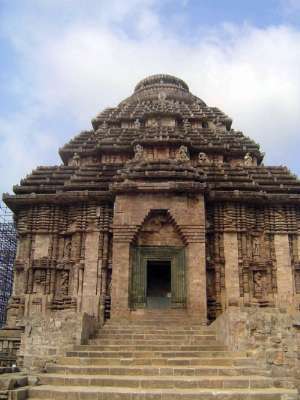 That lesser half, amounting to no more than the entrance porch or jagamohana of the vanished sanctuary or rekha is one of India's most spectacular sights. This is the straight-on approach. 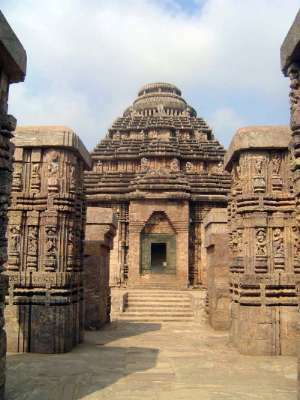 The surviving porch of the temple is the triangular mass behind this bhoga-mandapa or Hall of Offering. It's hard to imagine a more densely decorated surface. We'll ascend the platform. The roof is missing; it may have echoed the huge roof of the porch. 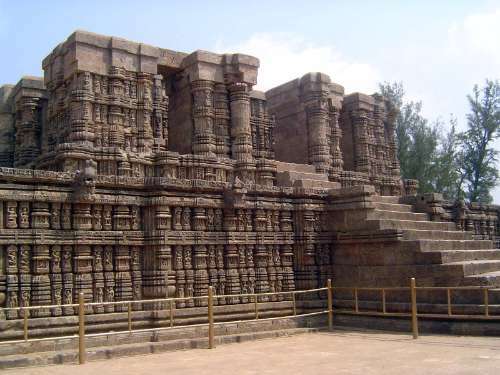 From the top, you can see across the intervening ground to the stairs rising to the entrance of the temple. The entrance, sorry to say, was blocked with rock and sand in the 19th century for fear that the whole thing would otherwise topple. 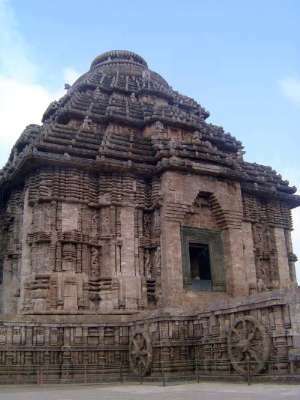 People who saw it before it was filled report that the interior was very simple, with corbelled stones stepping inwards on all sides to form a roughly pyramidal shape, corresponding to the external profile of the building. A closer view. The masonry blocks were laid without mortar, though there was a coat of lime plaster. The blank wall at the top of the stairs blocks the entrance. The top of the porch, seen from the south. There's a complex vocabulary for these towers. The step-like layers, for example, are called pidhas. 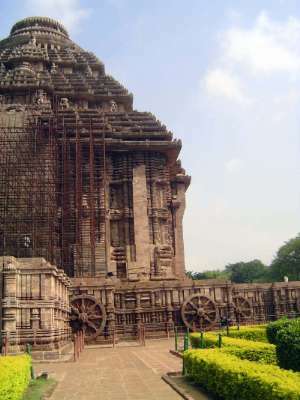 The structure simulates a temple cart riding on a dozen wheels. Another angle. 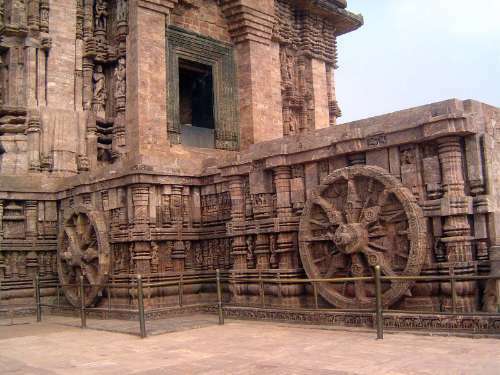 The wheels were invisible until conservation work after 1900 cleared away a layer of beach sand that rose to the top of the platform. 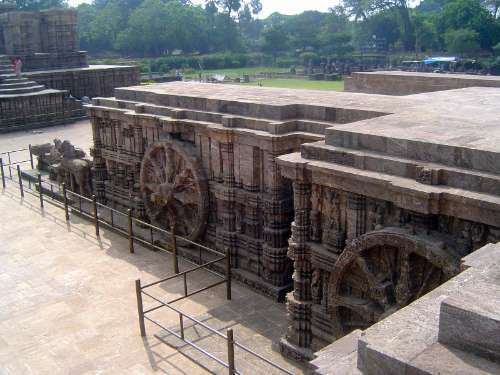 Seven horses pull the temple, which is dedicated to Surya, the sun god. 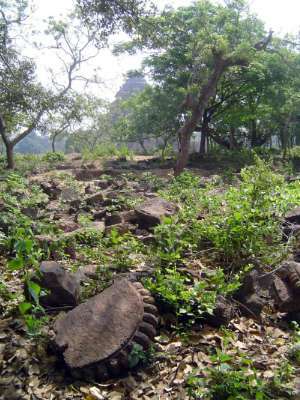 The image is of the cart rising from the sea, now receded about a mile from what was the temple's beach-front location. A "petrified procession," some have called it. 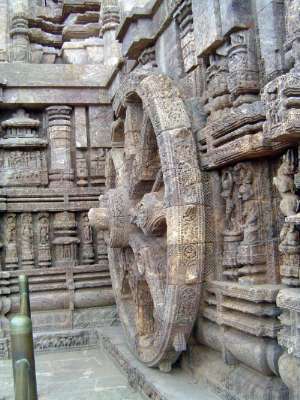 Perhaps their long burial in sand helped preserve the details of the wheels. Detail, down to the cotter pin. 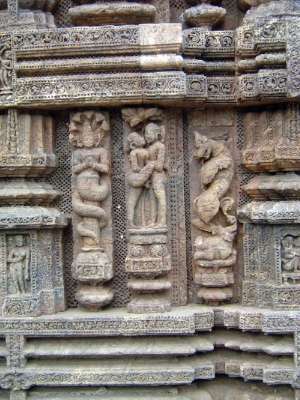 The temple has hundreds of sexual images. Side view, from the south. The view here is from the southwest and shows the stump that remains of the sanctuary that rose to a height half-again as high as the porch. 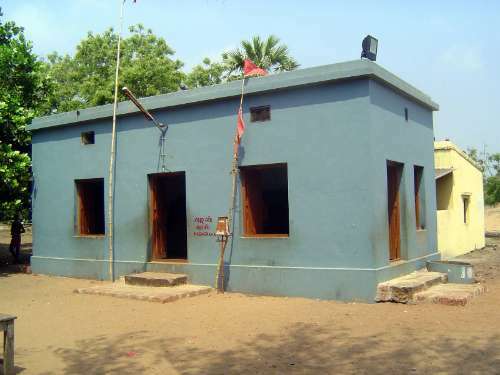 (This assumes that the sanctuary was actually built. 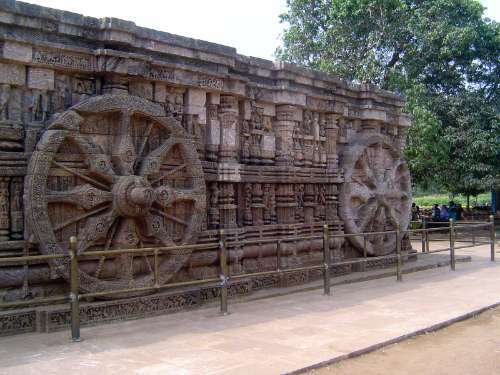 Parts of it certainly were, because fragments survived until a storm of 1848.) Fergusson writes: "There is, so far as I know, no roof in India where the same play of light and shade is obtained with an equal amount of richness and constructive propriety as in this instance, nor one that sits so gracefully on the base that supports it" (II, 107). 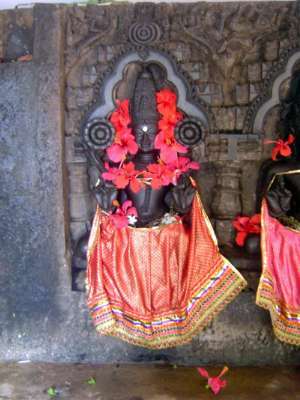 A niche on the north side of the sanctuary carries a statue made of chlorite. 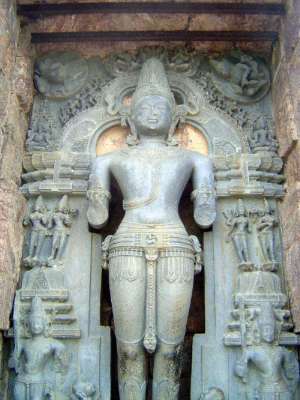 It's Surya, a form of Vishnu; flanking his knees (and only barely seen in this image) are two adoring dawn maidens. 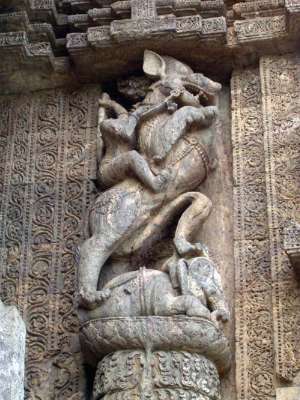 The decoration also includes mythical animals, in this case a leogryph (the Sanskrit name is simply vyala, "lion,") atop an elephant. 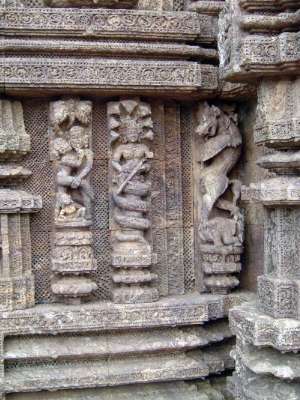 Another leogryph on the right; on the left, a pious nagni or female naga with a human head, snake body, and hooded cobras behind. 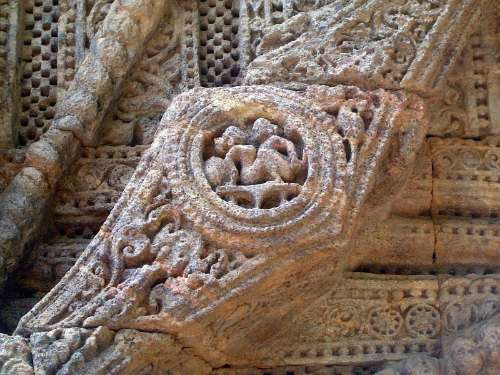 In the center is a maithuna, decorously or perhaps just very literally translated as a "loving couple." The arrangements (and positions) vary. A couple with a niche to themselves. 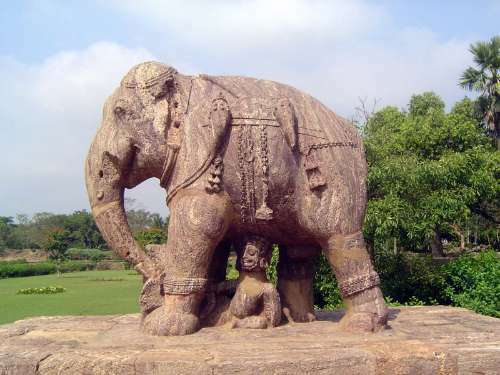 An elephant, masterfully soft. You can almost hear him walk by, silent as elephants are. 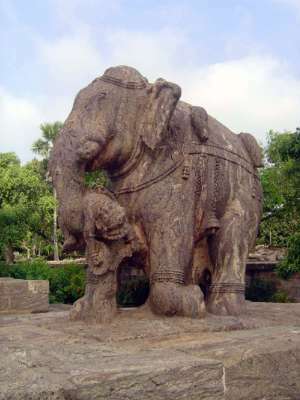 Soft but not necessarily gentle: another elephant prepares to hurl a demon. 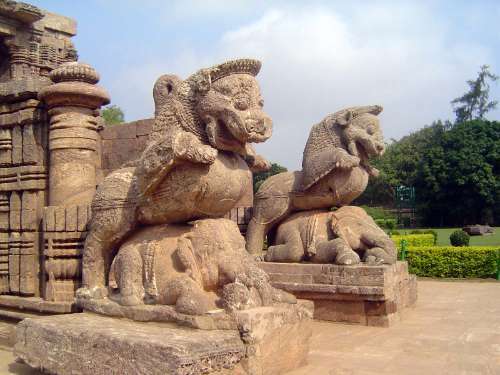 Lions atop elephants at the entrance steps through which we passed earlier. 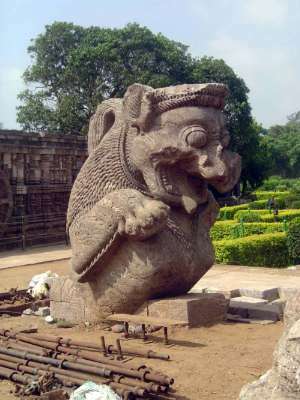 A colossal but fragmentary lion. 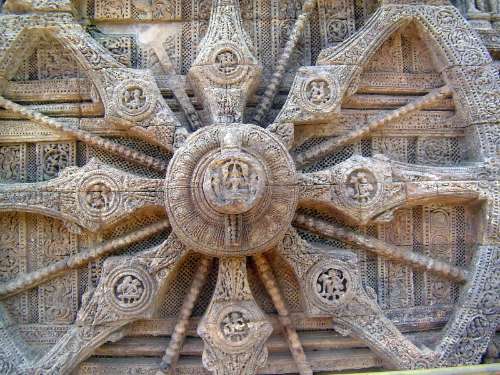 This is the ceiling at the entrance to the temple. 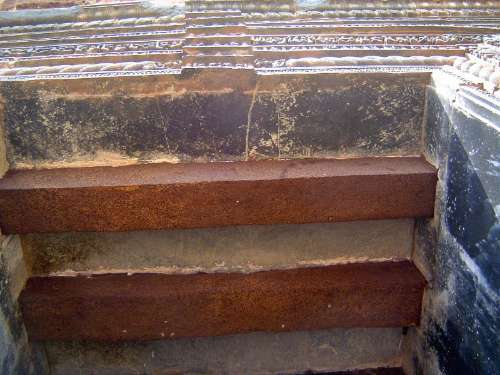 The iron bars are original, apparently made by beating a bundle of hot bars into a mass. Similar beams were used at the top of the corbelled ceiling in the interior of the porch. Originally, a stone architrave hid them. It's been removed and put in a nearby museum, after 19th century efforts to transport it to Calcutta foundered on logistics. 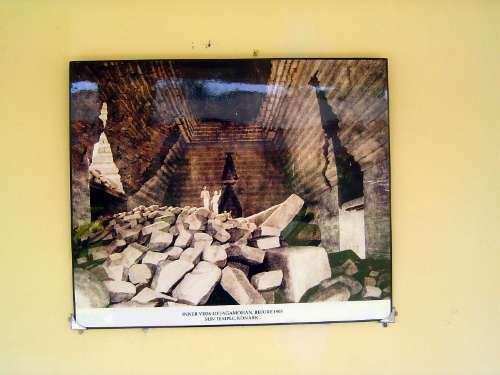 A photograph of the partially collapsed interior of the temple before it was filled with a layer of rock pressed flush against the walls, then filled tight with sand, which was finally poured down a 6-inch shaft drilled at the peak. Since then, fears of water accumulating in the mass have led to pressure-grouting of the exterior stones. Not impressed? But look inside. 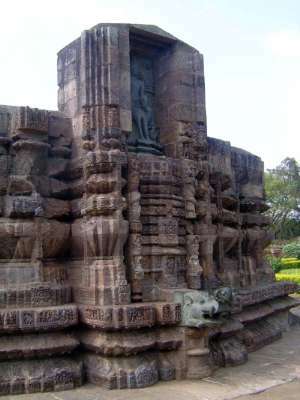 Here's that massive architrave, carved from the same chlorite used in the statue of Surya. 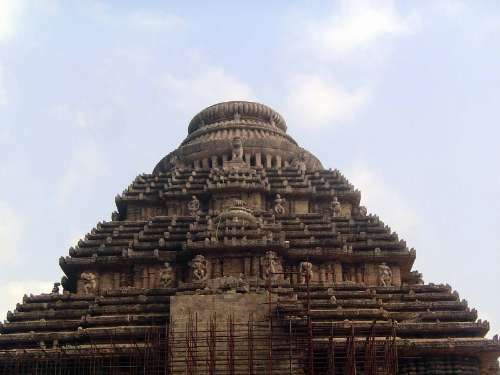 It was removed from the temple before 1838 by the local Raja of Khurda, who wanted to use it for his palace. Before he could do so, orders came from the British government to cease and desist. The British then attempted to move the stone to a museum in Calcutta, but it was too massive and so stayed here. 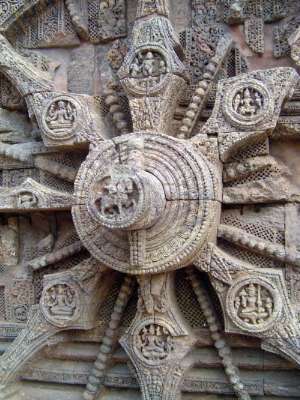 It portrays the nava-grahas, or nine planetary gods. 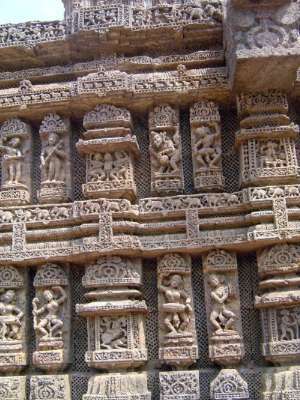 From left to right, Surya (Sun), Chandra (Moon), Mangala (Mars), Budha (Mercury), Brihaspati (Jupiter), Sukra (Venus), and Sani (Saturn). 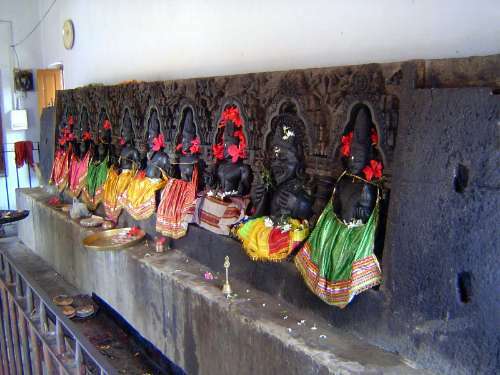 At the far right are Rahu and Ketu, invisible planets at war with the earth and sun. 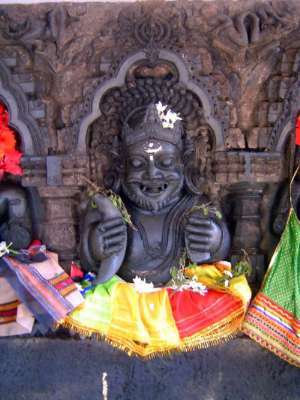 Rahu. He carries crescents because he is associated with lunar eclipses. 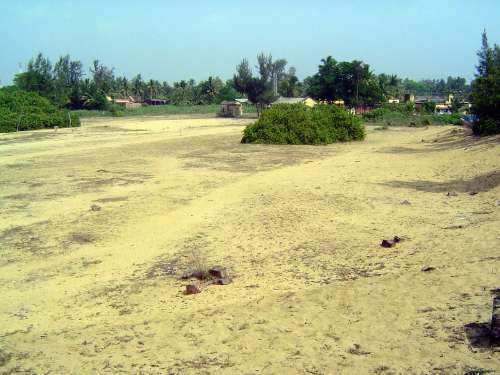 Despite the sea's retreat from the site, there's plenty of sand still around. And relics, whether of the destroyed sanctuary or of other buildings once standing in the neighborhood. Come early if you want to avoid the crowds.